For today’s post I’ve dug up somehting a little warmer than those from the past few days. I took this last summer as Sauble Beach on Lake Huron. Sauble is reported to have some of the most beautiful sunsets in the world, and I can certainly say it didn’t disappoint. I hope you like it. I can’t believe this is a lake!! 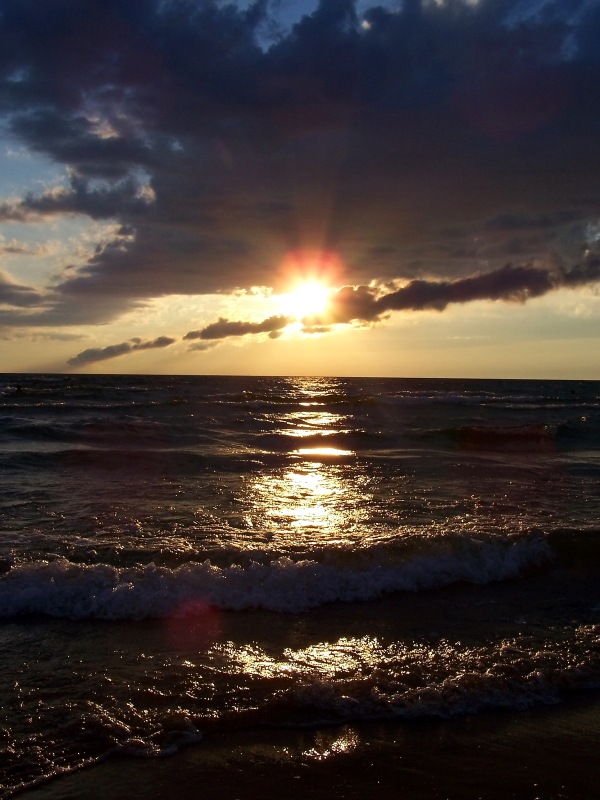 I’ve never seen the great lakes, but it boggles my mind… Anyhow, I love the drama of these sunset clouds. Beautiful. To have a rep for the most beautiful sunsets in the world is pretty cool! Thanks man! Good feedback. I am horrible for crooked horizons if I don’t use a tripod. I’ll see if I can correct it in Picasa and repost. I don’t think your horizon is straight Mikey. Would be easy enough to correct with some editing software. It’s also often better to have the sun off-centre, but it’s otherwise an interesting shot. Keep it up.